Scene setting: It was clear from Prada’s A/W 2019 runway set that something spooky was coming. For her women’s offering Miuccia Prada erected the scene that had featured in her menswear show earlier this year, at the Fondazione Prada’s performance-focused Deposito space. The catwalk was populated with an AMO-designed theatrical field of lighting, bulbs flickering as if strained during a scientific experiment gone-wrong (Frankenstein’s monster was a men’s motif). Guests sat on rows of tiered seating, composed from spiked layers of foam. Mood board: ‘It was about how to be good in a world that has a lot of bad,’ mused Mrs Prada backstage on the sinister sociopolitical landscape that informed her collection. She drew on the horror film references which abounded in her men’s collection, with high-school goth ensembles, like dresses featuring graphic Bride of Frankenstein prints, and others imagined in black broderie anglaise with striped sleeves. 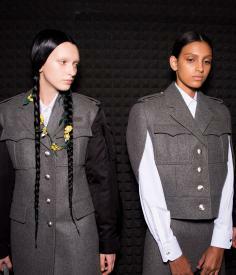 There were allusions here to Wednesday Addams, The Matrix’s Trinity and Ghost World’s Enid and models stomped in bovver boots and sported backpacks with colourful fake fur. The show’s soundtrack alluded to the girlish/gothic, romantic/rebellious elements in the collection, and included an instrumental version of Lady Gaga’s Bad Romance, the X-Files soundtrack and Someday my Prince Will Come. Pencil skirts were embellished with 3D flowers, capes were formed from delicate layers of lace and high heels glittered. ‘The romance alluding to ideals of goodness,’ Mrs Prada explained.